Blowing dense-pack cellulose insulation into the test walls. Building envelopes have a hard job in Interior Alaska—keeping us warm, dry and healthy at 40-below. CCHRC tests a variety of building designs and products to see how they can be applied in this environment. We recently studied the moisture performance of cellulose insulation to see how it compared to other common types, like fiberglass and rigid foam, and how it performed in a super-insulated house. First, let’s look at a conventional wood-framed wall with 2×6 or 2×4 studs and an interior vapor barrier. This system has historically worked in the Interior because the vapor barrier limits the moisture allowed into the walls and moisture that does sneak in remains frozen through most of the winter. During the spring, the walls thaw and dry to the outside. But when you add exterior foam insulation to a house, a common retrofit technique to save energy, the walls can no longer dry to the outside. Is this good or bad for the wall? Depends on how much you add. If you add enough exterior insulation (for example, six inches of EPS foam for a 2×4 wall) the sheathing and framing will stay warm enough to avoid condensation, improving your overall moisture control. If you don’t add enough, however, you move your wall sheathing into the danger zone—above freezing and very humid. 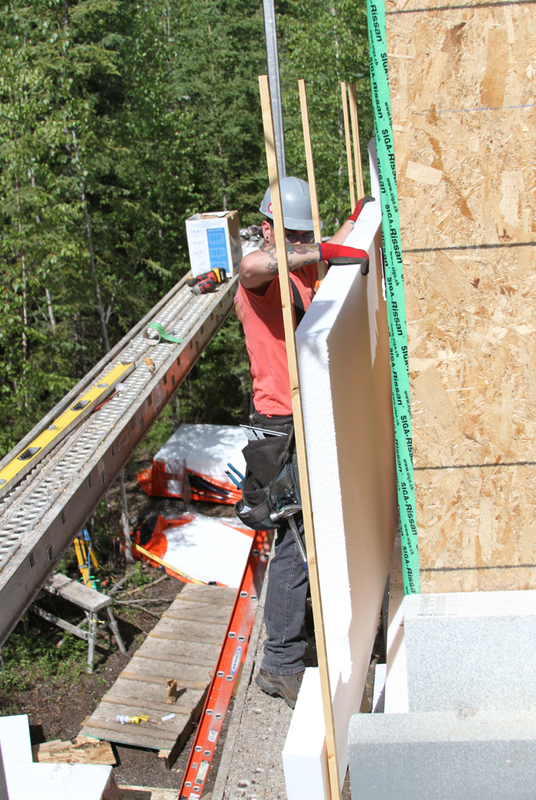 We’ve learned from earlier studies how to use fiberglass and EPS and XPS foam in various wall systems to improve energy efficiency while avoiding moisture problems (See cchrc.org/safe-effective-exterior-insulation-retrofits). This latest study looked at how cellulose performed in different wall scenarios over an 18-month period. These were not standard walls—they intentionally lacked a vapor barrier because we wanted to force moisture into the walls. Cellulose insulation is made primarily of recycled paper. 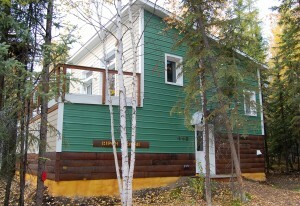 As a local, rather inexpensive product, it has recently become more popular in building in Interior Alaska. “Dense-pack” cellulose is blown into a wall to a density of 3.2 pounds force per cubic foot, which is designed to prevent the insulation from settling over time. Dense-pack cellulose has an R-value (or insulation value) of 3.7 per inch—slightly higher than fiberglass batts and slightly lower than EPS foam. Our study shows that cellulose can handle moisture better than fiberglass or EPS insulation when used properly. 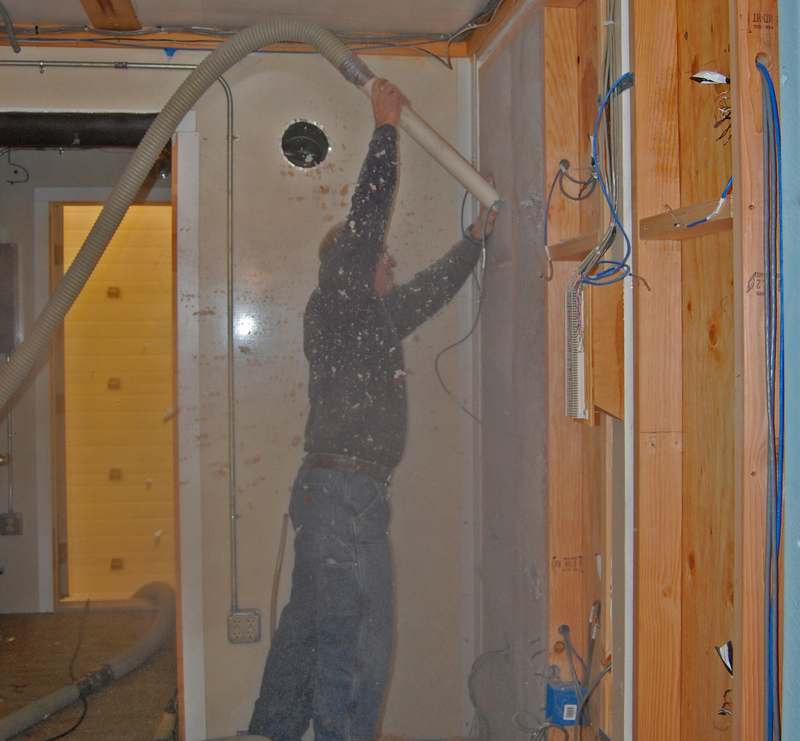 The test wall that used cellulose as both interior and exterior insulation maintained lower humidity levels (and was less likely to condense or grow mold) than the test wall that used interior fiberglass and exterior foam. That can be partly attributed to material properties of cellulose. Dense-pack cellulose is actually less permeable to air flow than fiberglass batts. So when used as interior insulation, it reduces the amount of moisture that migrates into the stud cavity. Cellulose also has the ability to absorb and release water vapor, allowing it to moderate moisture levels within a wall and prevent the large spikes in relative humidity that cause moisture damage. It’s also more permeable to water vapor than EPS or XPS. 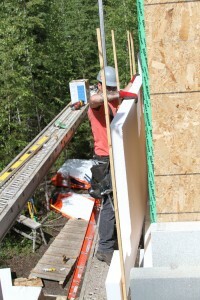 The test wall with exterior cellulose had lower humidity levels than the wall with exterior foam, because it allows faster drying to the outside. Based on this study, dense-pack cellulose can provide a good option for exterior insulation beyond rigid foam board. In future studies we plan to look at the minimum amount of exterior cellulose needed to keep the sheathing warm and dry. 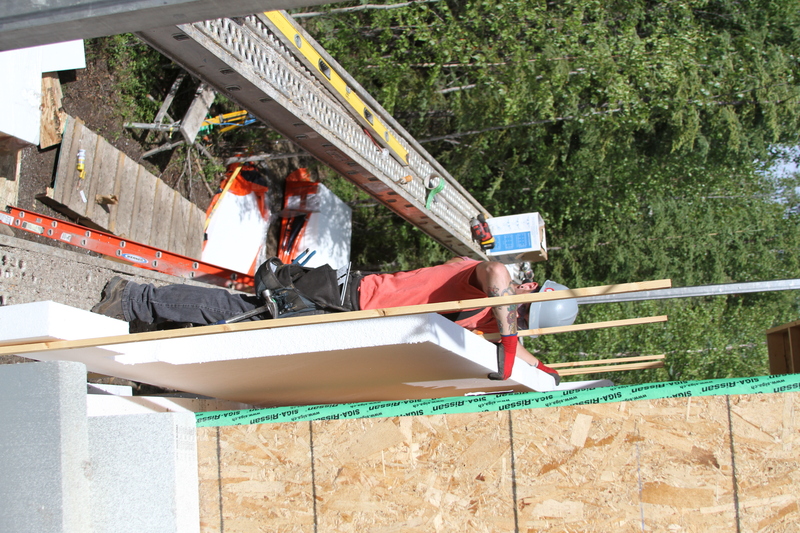 Posted in Ask A Builder and tagged alaska, CCHRC, cellulose, cold climate, cold climate housing research center, energy efficiency, fairbanks, Green Building, insulation, mobile test lab on August 13, 2014 by mrettig. The Alaska Housing Finance Corporation recently released a tool that could boost the appraised value of energy efficient homes. The AK Appraisal Tool, developed by AHFC, the Cold Climate Housing Research Center and Alaska Craftsman Home Program, allows appraisers to add value to a home that performs better than comparable homes. The tool could promote energy efficient housing through making efficient homes more affordable and increasing their resale value. Appraisers typically look at factors like square footage, number of bedrooms and aesthetic features like granite counter tops. If a house was super-insulated or used alternative energy sources, there was no accepted way to factor that into the appraised value. This tool provides a way to value energy efficiency based on the energy bills of a house compared to other similar houses in the area. You log onto the site and enter basic information about a house, including the community, the energy bills and at least two of the five following pieces: street name, number of bedrooms, square feet, rating points and year built. Our 1,800-square-foot test house was located in Fairbanks and had $6,000 in annual energy costs, including heating oil and electricity. The program then searches AHFC’s database of 105,000 housing units to find all comparable homes in the same area — in this case 85 — and calculate their average utility bills — $8,150. You can enter up to 10 other comparable houses (based on other appraisals). The program crunches all this information into the “net present value,” or the energy savings of the test house versus an average house during a 5-year period — $9,058. The appraiser can add up to that amount to the value of a home (all appraisals must be reviewed and accepted by the lending institution). The program also provides the impact to the mortgage payment. In this example, if $9,058 were added to the home’s appraised value, it would increase the monthly payment by $44 (based on a 30-year mortgage at 4.25 percent). But remember, the homeowner is saving $2,100 per year, or $180 per month, in energy compared to an average house, so the overall savings far outweighs the bump in the mortgage payment. Plus, the resale value of the energy efficient house is higher. There are benefits to the lending institutions as well. The fact that homeowners are spending less on energy every month increases their chance of making their mortgage payments. This reduces the lender’s risk of default and foreclosure. AHFC is already training lending institutions, builders and realtors to use the tool. Builders could also use it to show clients the potential energy savings and increased appraised value of an energy efficient house. Posted in Ask A Builder and tagged AK appraisal tool, alaska, appraisal, appraisers, CCHRC, cold climate housing research center, energy efficiency, fairbanks, mortgage, super-insulated on April 10, 2014 by mrettig. In construction, thermal mass refers to heavy, dense building components with a high capacity to absorb, store and release heat, for example—logs, masonry, concrete and adobe. These materials are used in the building envelope to provide structure, but their thermal properties mean that they can also provide other benefits. In this first article of a two-part series on thermal mass, we’ll address how thermal mass can be combined with passive solar design to reduce building heat and cooling load. Next week we’ll examine the effect of thermal mass for more conventionally designed homes in three different locations. Passive solar design uses a combination of building features along with the sun’s energy to provide heating in a home. Typically, a home’s orientation combined with south-facing windows and a large thermal mass are designed to collect, store and distribute solar energy during the heating season. During the summer, features such as deciduous trees or awnings can block solar energy from entering a house and causing overheating. Many homes in Alaska use passive solar design to provide part of their heating needs during the year. In passive solar design, there is no control system that dictates the movement of heat energy, as with a boiler or furnace. To understand how this might work, picture a house with a concrete floor in a south-facing room on a sunny spring day in Fairbanks. As sun’s radiation enters the room through the windows, it warms up the room and the thermal mass of the concrete floor absorbs this energy throughout the day. At night, the situation reverses. With no incoming solar radiation, the heating system will need to work to keep the temperature of the room at the set point. However, as the room’s ambient temperature drops below the temperature of the thermal mass, the stored heat energy in the massive floor radiates back into the room, stabilizing the temperature and delaying when the heating system needs to switch on. 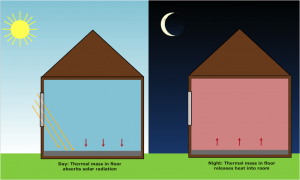 In effect, the thermal mass acts as a heat battery, storing solar radiation until the sun disappears and then releasing it back into the room. A properly designed passive solar system can result in energy savings for a home because the thermal mass can store excess heat during the day and allow it to offset nighttime heating loads. Although thermal mass is often in the form of a concrete floor, there are other ways to incorporate it into a home—such as a wall that receives lots of sun or a masonry bench or shelves in the sun’s path. As the days lengthen during the spring and summer, the large south-facing windows in the above example can allow too much solar radiation to enter a room and cause it to overheat. Some people install awnings or curtains, or plant deciduous trees to shade the windows. Thermal mass also helps prevent overheating, especially in early spring before deciduous trees have leafed out. A room that might have become uncomfortably warm during the day instead experiences less rise in temperature as the solar radiation is absorbed by the thermal mass. This energy is released later in the evening when outdoor temperatures are cooler. Overall, the thermal mass acts to smooth out temperature swings in the room, enhancing indoor comfort. Posted in Ask A Builder and tagged alaska, Ask A Builder, cold climate housing research center, energy efficiency, fairbanks, passiv hous, passive solar, thermal mass on March 19, 2014 by mrettig. While it might seem like summer is far away, the building season is right around the corner, and now is a good time to finalize any plans for upcoming home improvements. If you’re interested in reducing your home’s energy use, there are several opportunities this spring to learn about energy efficient building and retrofit techniques. The building addition at CCHRC, which opened last year, features passive solar design, radiant floors, a pellet boiler and a super-insulated building envelope. There are efficient technologies in the original building as well, including a masonry heater, ground source heat pump, a sewage treatment plant, solar photovoltaic panels and thermal storage. Tours are offered at 2 p.m. on the second Thursday of every month and feature both the original building and the addition, and include plenty of time for questions and discussion, as well. Spring 2014 tours will take place Feb. 13, March 13, April 10 and May 8. In addition, the Builders Resource Library at CCHRC contains information on many aspects of cold climate construction and heating systems. The library is open Monday-Friday, and a catalogue is available online atcatalog.library.uaf.edu (select CCHRC from the Library menu). Golden Valley Electric Association offers one-on-one instruction through its Home$ense audit program. Through the $40 program, an energy auditor visits your home to discuss ways to reduce your electrical usage and energy costs. To sign up, call the member services department at GVEA at 458-4555 or visit www.gvea.com. offer a one-day class on the Building Energy Efficiency Standard (BEES) on March 19 and May 22. This class covers the BEES requirements for insulation values, air leakage, moisture protection and ventilation. Fees and registration for these classes and more information can be found at www.achpalaska.com. For those interested in wood heating, UAF is hosting the Firewood Workshop from 10 a.m. to 2 p.m. Saturday in the Bunnell Building. The workshop covers how-to tips for cutting and drying wood, operating a wood stove and more. Finally, the annual Interior Alaska Building Association Home Show will take place March 28-30 at the Carlson Center and will feature topics including financing, remodels and new construction. 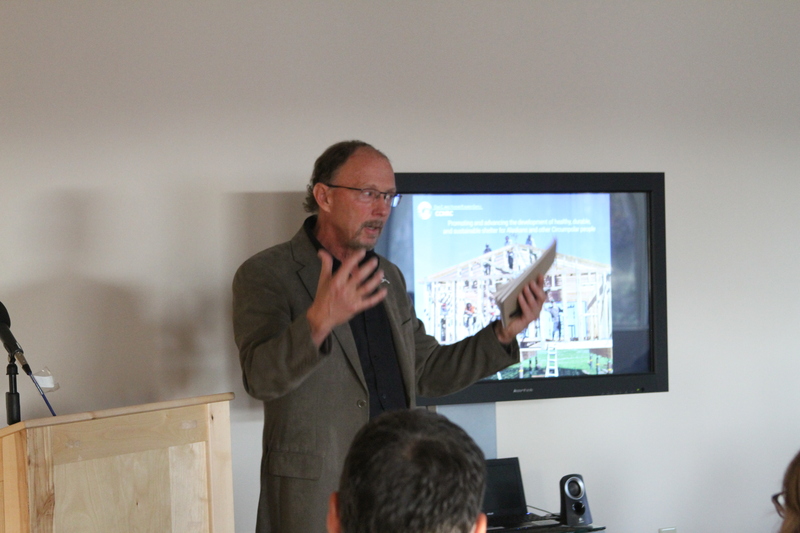 There also will be seminars and demonstrations on a variety of topics related to homebuilding. The home show kicks off the summer building season in Fairbanks and is an excellent way to gather lots of information about energy efficiency. Posted in Ask A Builder and tagged alaska, CCHRC, cold climate housing research center, energy efficiency, fairbanks, new construction, Retrofit on February 6, 2014 by mrettig. What’s a GFI outlet and where should I use them in the house? Typically, all electricity will flow from the “hot” slot through an appliance plugged into the outlet, and back into the “neutral” slot. The GFI outlet monitors the current flowing to and from the appliance. If the outlet senses an imbalance in the current flowing from the hot to the neutral slots, it will disconnect electricity flowing to the outlet. Most GFI outlets are very sensitive, and are capable of detecting a current imbalance of just a few milliamps. Such an imbalance generally means there is a current leak somewhere-the worst case scenario being that the missing current is flowing into a human, instead of back to the neutral outlet. GFI outlets shut off current quickly, in less than one-tenth of a second, so that extra current will not flow where it’s not supposed to. It can be difficult to know if you have GFI outlets in your home just by looking at them. They are recommended in areas of a building where there is water, because moisture increases the risk of electric shock (picture someone dropping a hairdryer into the sink). A few decades ago, they generally were only installed around pools and boathouses, but now are commonly found (and required by building code in Alaska) in places like bathrooms, garages, kitchens, crawl spaces, unfinished basements and outdoor outlets. Heat tape should be plugged into a GFI outlet because heat tape is typically protecting water pipes and therefore has the potential to be exposed to moisture. Some GFI receptacles have test/reset buttons on them. You can check if the GFI protection on these outlets is working by pushing the test button — which should shut off the current to any device plugged into the outlet. Pushing the test button will also cause the reset button to pop out. You can turn the outlet back “on” by pressing the reset button. GFI outlets can fail as power surges from the utility can damage their internal circuits, so testing them occasionally is a good idea. Other outlets have GFI protection at an “upstream” outlet or at the distribution panel and may have no test/reset button. In this case, to test a specific outlet, you will need to push the test/reset buttons on the upstream outlet or at the distribution panel. It’s just as easy as installing a regular outlet, though you need to pay attention to ensure the proper terminals are connected to the source. It takes a little extra consideration to wire it up if you are using it to protect outlets downstream. GFI outlets cost more to install than regular outlets. While a regular outlet can cost as little as a few dollars, GFI outlets can cost more than $20. This adds up when considering every outlet in a home and explains why electricians may install GFI protection at the panel rather than at each individual outlet. A similar type of outlet is an arc fault circuit interrupters (AFCI). These are required in the living room, bedrooms, hallways, at lighting circuits, and use a special circuit breaker at the distribution panel. While GFIs are designed to protect you from shock, AFCIs are designed to prevent fires when an electrical arc is caused by, for example, driving a nail into the wall and hitting a wire. GFI receptacles cannot be used on an AFCI circuit. Posted in Ask A Builder and tagged CCHRC, cold climate housing research center, electric outlets, Electricity, GFI, GFI outlet on February 1, 2014 by mrettig. Mold requires moisture, above-freezing temperatures, oxygen, and nutrients to grow. The nutrients can come from many building materials such as the paper facing on drywall or wood. Mold spores enter a home through open windows and doors, on the clothing and shoes of people, or in the fur of a pet. As mold spores are assumed to be present in most environments, they easily can enter a home. If spores land on a surface with available nutrients and moisture, they can grow into a colony. Preventing mold growth usually is focused on controlling moisture, since above-freezing temperatures and oxygen also are required by the house’s human occupants. In homes, water leaks and condensation are the primary sources of moisture that lead to most mold growth. Examples of water leaks would be a break in the building envelope, such as a hole in the roof that allows rain to enter, or a plumbing leak. Condensation occurs when humid air encounters a cool surface, such as the windows in an exterior wall. When air containing water vapor cools to the dew point, it can no longer hold as much moisture and that excess moisture is then deposited on the adjacent cool surface in the form of water droplets. Air with high humidity is common in bathrooms and kitchens because cooking and showering expose the surrounding air to substantial amounts of water. However, plants, aquariums and even breathing contribute to the humidity level in a home. Keeping indoor humidity levels low is a big step towards preventing mold growth. 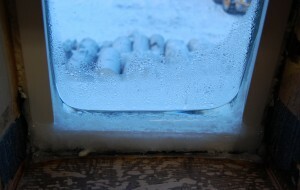 Although indoor humidity that ranges between 40 and 60 percent at room temperature is best for human health, the reality is that in an extreme cold climate with temperatures below -20°F (such as Fairbanks), levels of more than 30 percent can lead to condensation forming on cooler surfaces such as windows, exterior walls behind furniture, and in closets. Indoor humidity levels between 20 and 30 percent are much safer in terms reducing the condensation risk during winters in Fairbanks, especially during very cold periods. However, this will vary depending on the insulation level of your home. Humidity levels lower than 30 percent can be tolerated by humans, however a greater percentage of occupants may experience the physical discomforts associated with drier air. To measure the humidity level in your home, you can buy a hygrometer at a hardware store or online for between $20 and $60. To prevent humidity from reaching damaging levels and maintain healthy indoor air quality, tight houses will require ventilation systems, such as exhaust fans in bathrooms and kitchens or a whole-house Heat Recovery Ventilator (HRV). Even homes with a low overall humidity may have damp microclimates where mold can grow. Inspect areas such as crawlspaces periodically. A crawl space can produce large quantities of water vapor if damp soils aren’t covered with an intact and well sealed vapor retarder. In the crawlspace be on the lookout for water leaks, air leaks in ducts, or condensation on pipes, concrete or discolorations on wood surfaces — particularly around the rim joist area. Be sure to address any issues promptly. If there is standing water as a result of a leak, you have 24-48 hours to dry the area before mold spores can settle in and grow, so clean up the water as soon as you can, and then use a dehumidifier or fan to help dry out the area. Damp areas on walls can be eliminated by making sure there is air an air space and good circulation between the wall and any furniture, clothing, or other objects. Firewood drying indoors also can contribute to moisture loads. A plugged or disconnected dryer vent can introduce large amounts of water vapor into the air and go unnoticed. Inspect all vents to the exterior periodically to ensure they are in good working order. Eliminate any standing water in the home. You can prevent standing water in showers and sinks by keeping drains clear and clean. Keeping a pot or kettle full of water going on the stove should be avoided. Finally, if you do discover mold growth, it is important to clean it up as soon as possible to stop the mold from spreading and to prevent further occupant exposure. Posted in Ask A Builder and tagged alaska, CCHRC, cold climate housing research center, fairbanks, moisture, mold, mold prevention on January 29, 2014 by mrettig. Pellet stoves are similar to wood stoves, except they burn manufactured pellets instead of cordwood. Pellet stoves typically use electricity because they are partially automated: An auger moves pellets from a hopper to a combustion chamber, an exhaust fan vents combustion gases and draws in fresh air, and a circulating fan forces air through a heat exchanger and into a room. The stoves also can be controlled by a thermostat. Pellets are about a half-inch long and are made from compacted sawdust, wood chips and waste paper (they resemble rabbit feed). They can be made from biomass fuels other than wood, including nutshells, corn kernels, agricultural crop waste, sunflowers and soybeans. They are bound together by pressure and heat (no glue is used). Pellets are sold in 40-pound bags at local hardware stores, or you can buy them by the ton from a manufacturer. 1. Ideally, pellets should be stored near the pellet-burning appliance for convenience. The pellet storage location must be accessible for re-stocking as well. If you have pellets delivered, call the manufacturer to make sure a delivery truck can access the site. 2. Pellets must be kept dry so they don’t crumble, ideally stored in an area with a roof and walls. If stored on the ground, they can absorb moisture from wet soil. 3. Since they will be burned in an appliance, they should be kept as clean as possible — protected from dust and other contaminants. On that note, delivery trucks that blow pellets into a storage area can cause lots of dust, so the room should be sealed off from the interior of a home. 4. In Alaska, pellet delivery trucks typically use a direct auger system to transfer pellets into a storage system. If you order pellets from a manufacturer, ask how they will be transferred to the storage area and protect any fixtures, lights or pipes that could be damaged. Make sure the storage area can support the weight of the pellets. This last point is important because CO is a clear, odorless, and tasteless gas that prevents red blood cells from carrying oxygen. It is extremely dangerous because people cannot detect it. Typically, CO is associated with burning fuel in a combustion appliance, such as wood, pellet, oil or natural gas furnaces and boilers. CO can enter a home if a combustion appliance backdrafts, releasing combustion gases into a home instead of up the chimney. Stored pellets can release CO, according to recent studies, though the amount depends on several factors, such as the age, content and exposed area of the pellets. This is especially a concern for enclosed storage areas that contain large quantities of pellets and are accessible to humans, such as for district heating systems or on cargo ships. Not all pellets release measurable amounts of CO. Preliminary testing at CCHRC found no detectable CO emissions when the pellets were stored in a 30°F storeroom. Although when we sampled a plastic bag filled with pellets, sitting inside an 85°F room, the CO concentration in the bag was 60 parts per million (70ppm would trigger CO alarm if sustained for 1 hour). While the room may not have reached the same level as the bag (as the gas would have more space to diffuse), this shows the pellets have the potential to produce CO.
Be sure to take the proper precautions for a pellet storage area by ensuring the area is vented, installing a CO detector near the storage area, and being aware of the symptoms of CO poisoning. All homes with any kind of combustion appliance should have a CO detector in the living area to ensure combustion gases are not entering the home. Posted in Ask A Builder and tagged alaska, CCHRC, cold climate housing research center, fairbanks, Heating, pellet stoves, pellets, wood heat on December 30, 2013 by mrettig. How can I prevent window condensation in the winter? Windows can be a barometer for how much humidity is inside the home. On really cold days, you may notice condensation forming on the inside of your windows. This can be caused by one or a combination of factors: excess humidity, inadequate ventilation, or poor windows. To understand and correct a particular issue in your home, you need to know some basic properties of moisture. For example, if the indoor temperature is 70 degrees and the outdoor temperature is 0, then moisture will begin to condense on a single-pane window when there is roughly 15 percent relative humidity in the house. A double-pane window will cause condensation at around 25-40 percent relative humidity, and a triple-pane window at between 30-50 percent. These are rough numbers are based on average window insulation values. The recommended indoor humidity levels for occupant health and comfort range from 30-50 percent. The general rule in a cold climate, however, is to target the lower end of this spectrum due to the risk of condensation within walls and ceilings. If your house has adequate mechanical ventilation, humidity is less of a concern. In Fairbanks, it’s tough to maintain anything close to 50 percent humidity in a properly ventilated house, because the winter air is so cold and dry. Because of its low moisture content, the inherent dryness of Fairbanks winter air is good for homes but not always the occupants, since the dryness can cause discomfort. Three things: make sure your home is properly ventilated, aim for less than 40 percent relative humidity to keep both you and your home healthy, and consider replacing your windows or adding moveable window insulation during cold months. If you already use mechanical ventilation and have low interior humidity, but are still having problems, you may need to examine your ventilation setting. If you have a heat recovery ventilator (HRV), it may be recirculating too often, which can contribute to increased moisture build up in the air. Recirculation mode closes the connection to the outside and brings exhaust air back into the rooms. Recirculation mode keeps the HRV core defrosted and saves energy, but sometimes it can run too long. Some experimentation with the HRV settings may be necessary. For example, in 20/40 mode the HRV brings in fresh air for 20 minutes and then recirculates for 40 minutes, and likewise for 30/30. If you’re getting condensation in your current mode, try decreasing the amount of time the unit recirculates. Also make sure air is allowed to circulate—either passively or mechanically—throughout the entire house. If you close the door to the bedroom, the air can become cold and moist enough to condense on windows. 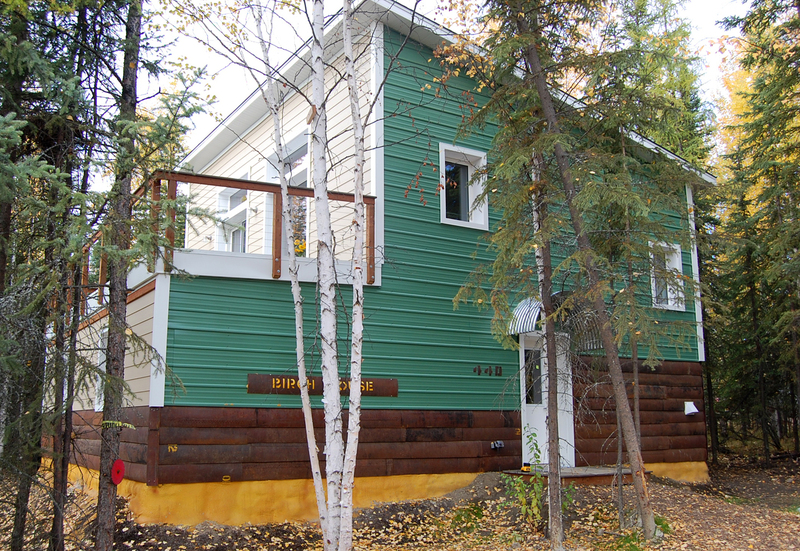 Posted in Ask A Builder and tagged alaska, CCHRC, cold climate housing research center, cold climates, energy efficiency, energy efficient, fairbanks, Sustainability, triple pane windows, Windows on November 27, 2013 by mrettig.